It’s time. Time to talk mastering. Mastering is often regarded as mystical process — the step that makes the difference between a demo and real release. I’m here to shed the light on what mastering really is and how to do it. Mastering in today’s terms is essentially the last step of treatment before the record is finished. It’s the part of the process where the entire mix is processed to stand in its best light. It’s like a second abbreviated shot at the mix just to do those final touch ups. In order to understand mastering we need to understand mixing. The goal in mixing is to get all the elements of a record to work together in the best possible way. Once the mix is finished, mastering is simply a continuation of that process. The core difference being that processes that are used in mastering are applied to the entire mix, rather than individual tracks. What this means is that the real secret to a great master — is a really really good mix! This is where I think a number of producers go left. They rely on the master processing to do the job that should be done in the mix. Step one is to get things as close to a finished master before actually mastering. Oh, and before we get into it, make sure you are leaving plenty of headroom going to your master channel before you start applying mastering processes. There are however a few processes that often times work best or at the very least work well in the mastering phase. The number one tool used by the best mastering engineers in the business is EQ. There is nothing wrong with adding EQ to the entire mix. If you are in DIY mode, look for broad EQ moves — a dB or two of treble, a dB or two of bass. If you are doing narrow boosts or cuts, you probably want to revisit the mix to work out whatever you are trying to do. Just to get a sense of what you are trying to do, grab a record that you like and turn the volume way down. About to the level of your mix. Play that record, then play yours. Listen for general differences: is the reference record a lot brighter? Darker? Bassier? More low-mids? Less low-mids? Don’t try to make the records sound the same, but maybe give them the same kind of broad frequency curve. Hip-Hop tends to feel best when the bass is strong, the top end is strong, and the area of the midrange that contains the vocal clarity and crack of the snare is present. Being a touch heavy handed in any of these departments is not necessarily a bad thing. Lastly, don’t believe the hype. Regular EQs are just as good for mastering as Linear phase EQs. The roll of LinPhase Equalization in mastering is 100% marketing. Not to say that they might not have a sound that you like, but just to say that regular ol’ EQ is just as good (and to my ear usually better). Compression tends to be a hot topic. 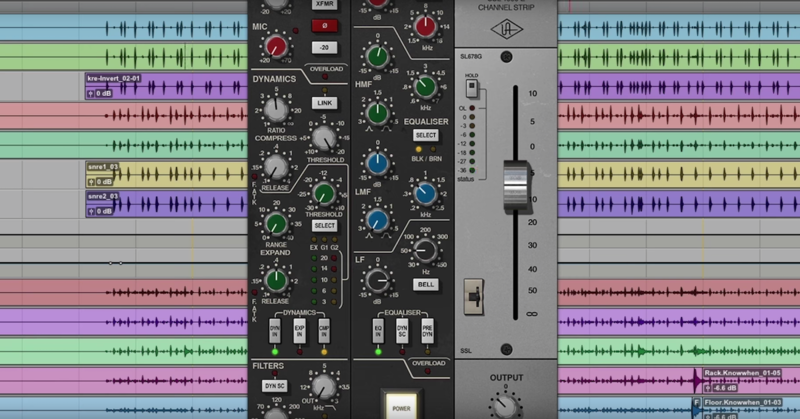 We tend to think we need compression, or multi-band compression, to get a great master. The reality is we don’t. We can use these tools stylistically if we want to — but it’s rarely a necessity. When I mix a Hip-Hop record I’m only applying any kind of master buss compression about 20% of the time. I do it to bring out a touch of extra punch or perhaps a bit of movement at the very end. But these are both ideas that I try to accomplish during the mix phase. That said, grab a compressor, throw it on and try a few things. Do a long attack/medium release/light ratio (2:1 or less), and see if that brings out the drums in a way you like. If you dig it, keep it. If you’re on the fence, throw it out. Certain software seems to propagate the idea that exciters, multi-band compression, multi-band imaging, and reverb are processes that are used in mastering. They’re not. These processes are only used by mastering engineers when they need to correct a very poorly mixed record or they are doing something deliberately stylistically. I recommend experimenting with all of these things, and then turning them off. Be especially careful with exciters — they tend to provide immediate gratification but can easily make a record thin or harsh. If you are going to use them at all (which I don’t highly recommend, but they can be cool at times), do so with discretion. If you are hearing a huge change to your mix, you are probably using too much. Limiting aka Louderizing. Limiting is the ultimate compromise in mastering. A limiter reduces the attack elements of drums and other instruments and removes overall punch. In the process of doing so, they allow you to make the apparent playback level of the record louder. My suggestion when using a limiter is to use some kind of system of constant gain monitoring. Meaning if you boost 8 dB into a limiter, turn the output of the limiter down 8 dB. This way as you are setting the level of the limiter, you aren’t hearing the playback level get louder. This allows you to objectively hear what the limiter is doing to your record. You’ll hear that it’s taking away energy and punch. When you get to the point where you feel you are losing too much life from the record, stop. Back the limiter off some, and then turn the output of the limiter up. Your record will be good and loud. I recommend not trying to compete with the playback level of commercial records. The reasons for the extreme playback levels are political, not musical. If it’s loud enough to playback over laptop speakers clearly, and loud enough to play strongly in a club, it’s loud enough. The commercial cats pay people like Chris Athens and I to make records unnecessarily loud with as little compromise as possible. We have a specialized skillset in doing this — and even we think it’s a bad idea. Value the excitement and life of your record over the playback volume — your fans will thank you. That’s my primer on mastering Hip-Hop records. If you have questions or comments feel free to drop them in the comment section below! Also, you might like the video below on some basics of the mastering process.